At least two companies that lease aircraft to Avianca Brasil have filed a lawsuit against the airline to request the resumption of the aircrafts for lack of payment. 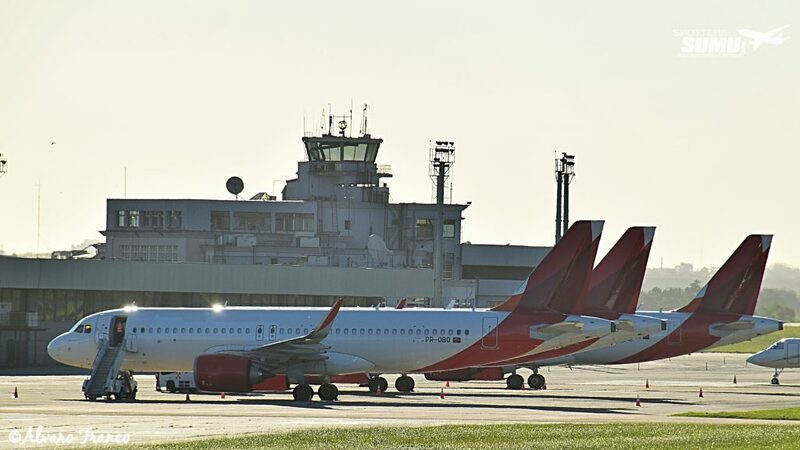 In the most recent case, the Irish subsidiary of BOC Aviation won, in the first instance, a case against the airline to recover two Airbus A320-351N. Avianca appealed the sentence. The order, dated November 26th, authorizes "the requisition of police reinforcement and burglary order, if necessary". We found with people familiar with the lawsuit that the payment had not been made for at least two months. The amount of the case is R$3.5 million (US$0.9 million). People related to the aeronautical sector told that the airline is considering asking for a judicial reorganization in the next few days. Last edited by atcsundevil on Tue Dec 11, 2018 11:07 pm, edited 1 time in total. Sad news. I've seen this movie in Brazil with VP, TR, RG and many others. TAM just survived due it's selling (or JV, whatever) with the former LanChile. Hope they find a way out of this. Brazilian market need AV to keep rates/services in a reasonable level due competition. In a country where the domestic market is largely LATAM, Azul, and Gol, Avianca Brasil is a distant fourth: LATAM has the large international market. I thought AV Brasil is a major part of the strategy and growth plan of Avianca? Without Brazil, Avianca cannot rival LATAM. 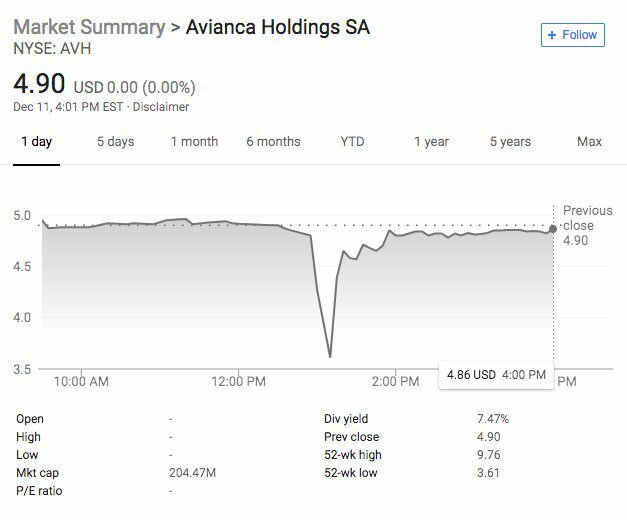 Would Avianca Holdings pump capital to save AV Brasil? I think medium term sustentabilty of O6 (Avianca Brasil) is what have been keeping AV away all these years. Times Trump blamed for Max8 Crash: 5 / WN: 2 / FAA-Boeing-NTSB: 3. The merger never happened, because the Efromovich brothers wanted to use it to dilute the other AV shareholders. The issue is that O6 never reached the point in which that became attractive for them to pursue. The following aircraft have been stored, in an attempt that a deal can be reached and that they don't get repossessed. The 318s have been out of service and stored for a good while now, IIRC, @ BSB. PR-ONZ is at Sao Jose dos Campos awaiting delivery to Avianca Argentina. It has not flown for a while. They have some A318 flying mostly SDU-BSB, SDU-CGH BSB-IOS and BSB-JDO routes. They might be a "distant fourth" due to their absence in some major markets (they only recently launched flight to Belem) but where they do operate they offer a vastly superior product with competitive prices. Domestic fares in Brasil are ridiculousely high. G3 and AD are nowhere near the LCLF that they pretend to be. Brazilian sites are reporting that United Continental Holdings agreed to lend 456 millions USD to the Synergy Group, who owns 100% of Avianca Brasil and 60% of the Avianca Holding. Domestic fares in Brasil are ridiculousely high. They aren't. G3 average fare for 2017 was lower than 80 USD. Which is not really telling since most of the traffic is concentrated on the 227 mi Sao Paulo to Rio route. Now try to fly to the Northeast or the North. Only in Canada and China I've I seen such high fares for under 2-3 hours flights. Can you please give us a single flight example with this rate please? C'mon, don't use the lowest rate, for the most unwanted flying times, for the most common route. Check G3 prices in high periods and then we discuss, they charge CGH-CWB up to BRL 1.700 sometimes, which means around USD 450 for a 50mins/180nm flight. That loan is not related directly to Avianca Brazil. It is part of the proposed JBA agreement with Avianca Holdings, COPA and United Continental Holdings. The money is for Synergy to cancel some substantial debt that matures within a year. Mr Efromovich had to put down his participation (not sure if partial or total) as collateral for the loan. So if he defaults on it, United Continental Holdings will become a shareholder at Avianca Holdings NOT Av Brazil. Maybe the title of the thread should be changed accordingly ? Does someone have knowledge on Brazilian bankruptcy law ? What does this mean for the airlines, are they shutting down or is this something à la chapter 11 ? They have filed for the equivalent of a Chapter 11 protection. Looks like that Avianca Brasil (O6 - Oceanair) has filed for "recuperação judicial", equivalent of the US Chapter 11 Bankruptcy protection. This is rather interesting considering all the ongoing negotiations that German Efromovich is doing between Avianca Internacional - United - COPA, essentially United would keep a controlling stake....but they kept Avianca Brasil (O6 - controlled by Jose Efromovich) out of the negotiations. . I understand you are looking at Avianca as a passenger, one concerned with some product attributes and price. But step back and look at the situation of the company: If they are in dire financial straights, the price/service proposition they have had in the market is not sustainable. They were careless to expand at a fast pace with price points that were below what they needed to be viable. I think you nailed it. Well said. What could happen to their cargo division? There is only one freighter aircraft flying as O6 (PR-ONV). Domestic fares in Brasil are ridiculousely high. G3 and AD are nowhere near the LCLF that they pretend to be. 1. They must be operated efficiently. Is this the case? 2. They need to collect sufficient revenue to enable them to operate at a profit. Is this the case? From First to Worst: The history of Airliners.net. All posts reflect my opinions, not those of my employer or any other company. There goes another A318 operator. All there is left now are AF, BA (BA1/2), AV and TAROM. Except Avianca Brazil isn't gone...its just reorganizing. Could it lead to them shutting down? Yes. But right now, its operating. Im sure thats no confusion at all. Irony or are you also confused? 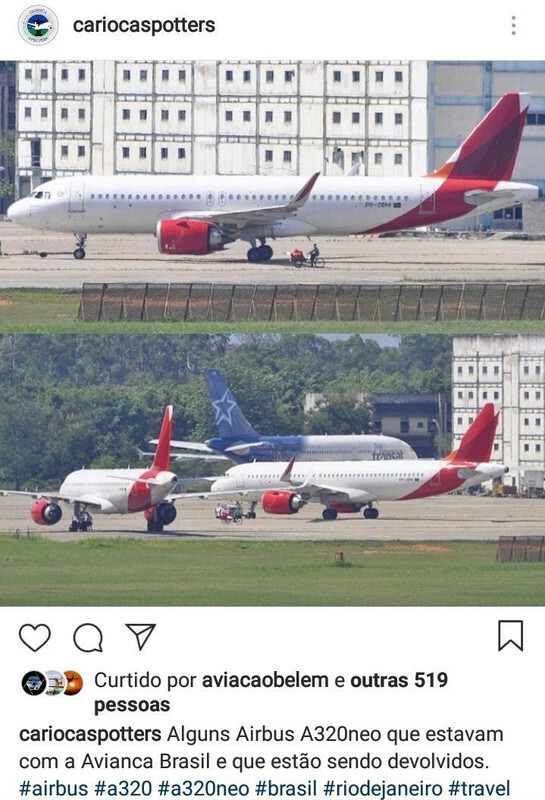 Avianca Brasil started returning their A320neo. I heard that Azul were considering the possibility of joining the AV-UA joint venture. Are they preparing for the worst? I am going to bet the stock price dip is caused by automated systems that scan the newswire for negative stories and buy/sell based on that. Lessors are now taking back their fleet aggressively. Nearly all their fleet are leased. That article is from before they filed for bankruptcy protection. Thanks for the insight. Indeed, many of the lessors do not want the same KF bankruptcy situation to happen again to them. Azul Linhas Aereas has taken delivery of both the above A320neo. What is interesting is if Azul is paying less or more, since AD has a lot better credit than O6. I'm actually surprised that they didn't make a play for the repossessed A332. All but a handful of O6's fleet is leased. If O6 were to collapse, would AD be likely to be admitted to Star Alliance at least as a connecting partner? AD has its immense domestic Brazil network to offer the alliance. No, Azul wants grow in the US Market and hás the advantage United's 8% in the Company. Rio and all South America by Panair do Brasil’s jets. PR- OBL & M A320NEOs, have been stored since mid December. I hear that 140 employees have been laid off. It appears that next Monday (14/1) will be a key date for the future of Avianca Brazil. On that day a judge has to rule on whether the airline can proceed with its reorganization plans or else. Not sure if a worst case scenario would include a potential liquidation of the airline. Perhaps someone from Brazil and more familiar with the due legal process there may be able to expand on the topic. 3 A320NEOs (PR-OBL/M/O) flew from GIG to MVD today for what I'd imagine is a return to the lessor/s. Avianca Brazil's fleet is down to 6 NEOs. Previously: 2 A320neo's and 1 A320ceo's are returned, now 3 A320neo's are following to be returned to lessors. A trio of ex-O6 A320NEOs at MVD/SUMU awaiting their next assignment.